...following development in the First Republic-History of Austria clearly demonstrates the important connections between economic decline and political destabilisation, on the one hand, and the loss of national independence, on the other. The review of circumstances leading to disastrous outcomes reveals that Austria, with its chronic economic problems, a possible (?) inferiority complex and inflexible macro-economic policies became extremely vulnerable for any dogmatic developments. Austria's politicians failed to cope with the challenges of inflation and unemployment, and their enthusiasm (!) for STRICT MONETARY POLICIES encouraged social unrest and political polarisation. Coming back to the example of the Austrian tourism-sector which gained ground in the 20s: The introduction of the "1,000 Mark limit" in 1933, aimed at restricting German tourists' expenditure in Austria, was intended to further the (already existing) destabilisation of Austria's crisis-ridden economy and thus prepare the way for the National Socialist takeover. 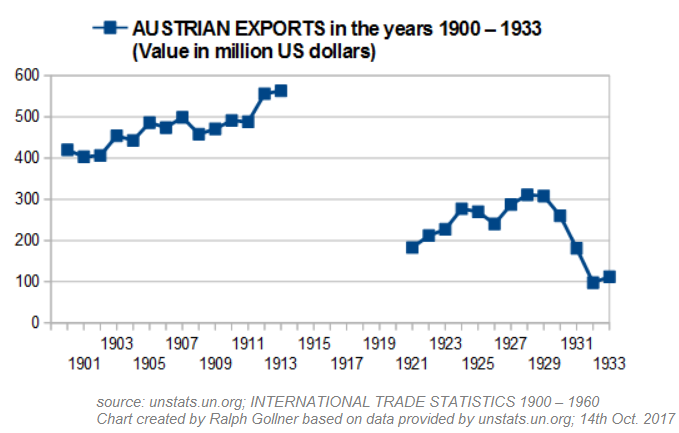 In the period 1928 - 1937 more than 80,000 Austrians emigrated for economic reasons. Most of them went overseas but a few took up jobs as seasonal workers in Germany and France. The phenomenon was even supported by Andreas Thaler, Minister of Agriculture, who organised a large-scale emigration to South America. The peak of emigration was reached in the 1920s, since as a result of the Great Depression most countries drastically resricted immigration! In 1929 Austria's total population amounted to approximately 6.7 million, with a third living in Vienna. The number of people in dependent employment was ca. 2 million. But once structual and cyclical unemployment coincided, the shattering effects of mass pauperisation caused the "Big crisis in a small country" (quoted by Dieter Stiefel). The unemployment rate reached its abolute peak of 25.9 % in the year 1933. According to the estimates of the Institute for Cyclical Research the highest proportion of unemployed, who did not receive unemployment benefits, was even 40% ! 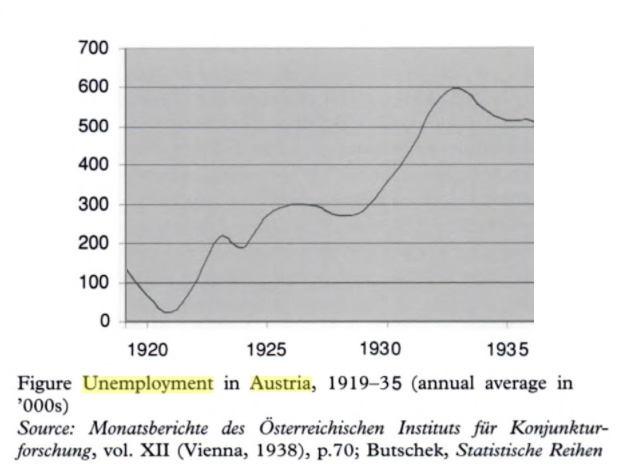 Unemployment was the most serious economic, social and political problem in Austria in the inter-war period. Failure to master this problem contributed decisevly to the demise of the First Republic. In 1933 the sociologists Paul Lazarsfeld, Maria Jahoda and Hans Zeisl published their highly acclaimed book, The Unemployed of Marienthal, which has since become a classic work of empirical social research. They analysed the destructive and demoralising consequences of long-term unemployment in a cotton-spinning community near Vienna. Partly due to the strong pressure exerted from abroad, the state and the bank of issue took on liabilities totalling aproximately 1 billion Schilings, which made about 10 % of current GNP. (But) the most important problem was the restructuring of the Austrian banking system. The reconstruction of the Creditanstalt was carried out via arrangements in the years 1932 and 1933. The closing chapter of this crisis was written in 1936, when a new arrangement was negotiated with bank's foreign lenders. The new agrrement laid down that the debt was to be reduced by about a half. But as a result of the economic crisis, the other two large Viennese banks, the Wiener Bankverein and the Niederösterreichische Escompte-Gesellschaft, had got into increasing difficulties. (So) the federal government had to bail them out too. Eventually the Wiener Bankverein and the Creditanstalt were merged on equal terms and the Creditanstalt-Wiener Bankverein came into being. Due to large national debt and the liabilities of the big banks, initiatives concerning employment remained limited in scope. Influenced by foreign examples, the government initiated three employment programmes, accompanied by considerable propaganda, beetween 1933 and 1937. However, these remained more or less ineffective measures to fight mass unemployment. "While other countries made use of the state's borrowing capacity to ameliorate suffering and unemployment, Austria was obliged to its foreign creditors to limit government expenditure to the bare minimum. But what the foreign creditors demanded was to a large extent identical with what Austrian governments themselves considered to be the most appropriate economic policies between 1932 and 1938."